Recorded at: The Glenn Gould Studio, CBC, Toronto,, 29-30 September, 2008. Layout and Design: Dimce Isailovski. Artwork: Melissa from Triniti (Paris), mixed media, 1999 by Dimce Isailovski. Pantcho Vladiguerov (1899-1978) established large-scale orchestral composition in addition to producing much chamber music, opera, and ballet in his country, Bulgaria. Known as a brilliant pianist and pedagogue, Vladiguerov taught at the State Academy of Music which now bears his name. His compositions contain influences of traditional Bulgarian music, through melodic characteristics and the textural sounds of instruments such as the bagpipe (gaida), the end-blown flute (kaval), the oboe-like zurna, and the plucked tambura . Thus, Chant, his own arrangement for violin and piano from his orchestral Bulgarian Suite, has a melismatic, at times seemingly metreless melody. The work that has long been considered a masterpiece of Bulgarian-infused idioms is the Rhapsody Vardar. Named for a region and river that no longer is part of Bulgaria, the work opens with an additive metre, so characteristic of Bulgarian music. In this case it consists of three beats plus two. Later in the rapid central section there are references to the timbres and techniques used with traditional string and wind instruments. Humoresque isa delightful work originally written for piano alone. The beloved violin encore piece, Hora Staccato, has a Romanian composer, Grigoras Dinicu (1889-1949), as its creator. He wrote it while a violinist in the orchestra of the Ministry of Public Instruction. Today Vladiguerov’s arrangement is the one regularly used. The title refers to the circular formation dance where the dancers hold hands, known as horo in Bulgaria. The Canadian repertoire on Remembered Voices begins with the Sonata by Gena Branscombe (1881-1977), born in Picton, Ontario. After music studies in Chicago, graduating with gold medals in both composition and piano performance, Branscombe had a long career as a pianist, teacher, composer, and conductor winning recognition in North America and Europe.The one-movement Sonata features three contrasting thematic groups after an opening restless introduction. After receiving her early music education in Montreal, Violet Archer (1913-2000) did advanced studies in composition with Béla Bartók, who instilled in her an abiding interest in folk music. Fantasy for violin and piano originated as a work for clarinet and strings. The violin and piano version received its première with Ethel Stark, the noted Montreal violinist and conductor with the composer at the piano. Written just after the end of the Second World War, it seems to be imbued with melodic lines reminiscent of Jewish chanting. The later composition, Prelude and Allegro, has a dance-like Quebecois fiddling atmosphere after its dramatic slow opening. Both Archer and Patrick Cardy (1953-2005) resided in Ottawa. Cardy came to the city in 1977 when appointed to Music at Carleton University. In his work Liesel, Suse, Ilze and Gerda the theme of the Second World War and Jewish suffering returns. Vladiguerov whose mother was a Russian Jew related to the famous writer Boris Pasternak, had protected Jewish musicians as much as he could during the War. Cardy’s piece received its inspiration from the memoirs of Gerda Weissmann-Klein, who told her story in a 1995 documentary. She was the only survivor of four teen-age friends, Liesel Steppe, Suse Kunz, Ilze Kleinzähler and Gerda, who were among 2000 women and children taken prisoner. Herded by Nazi SS Guards they began the forced march across the Czechoslovakian countryside from January 29 to May 7 in 1945 with almost no food, no shelter and woefully inadequate clothing. Just one day before the end of the war, the SS Guards abandoned their prisoners in a ruined bicycle factory in Volary, Czechoslovakia, and disappeared into the nearby woods. Only 195 of the prisoners remained alive when they were liberated by American troops. Gerda married the American soldier who first found them in the bicycle factory. The theme of folk music elements returns in Remembered Voices as its composer, Mary Gardiner, based the work on the haunting Canadian folksong from Newfoundland, “She’s like the swallow.” Consisting of three named sections, Remembered Voices had its last two, “Elegy” on unhappy love, and the “Dance” evoking a Newfoundland party, composed in 1996 as a commission from the Association of Canadian Women Composers. The composer added the opening “Song” in 2002. Tcholakova has an active international solo career and has performed as a soloist with orchestras and at chamber music series in Argentina, Austria, Belgium, Bulgaria, Canada, Croatia, Czech Republic, Denmark, Ecuador, France, Germany, Russia, Serbia, Slovakia, Slovenia, USA and Uruguay. Her concerts have been recorded for broadcast for CBC and other radio stations in Canada as well as for Bulgarian National radio and television. She is the recipient of numerous bursaries, scholarships, awards and grants such as Svetoslav Obretenov Bulgarian National Competition, Sarasota Kiwanis Club, Baden - Baden Lion's Club, Ottawa Symphony Orchestra, Austrian Ministry of Culture, FACTOR, Europe 2000, Canada Arts Council, Ottawa City Arts funding and the Canadian Department of Foreign Affairs. In 2006 her essay “Footsteps to Eternity” about Mozart's life, was published in the first Anthology book in connection with the celebration of the composer's 250th birth anniversary in Bulgaria. The Austrian Embassy in Sofia, Bulgaria sponsored this anthology “Mozart-Genius.” Most recently, the Canadian Embassy in Romania granted Tcholakova their entire 2006 and 2007 budget for Bulgarian culture, in order to organize the first and second "Days of Canadian Culture" festivals in Sofia, November 24 through November 26, 2006, December 1 - 2, 2007. The Third Canada Days take place in Sofia, November 28-29, 2008. During 2007-2008 she is a visiting professor for Mendoza and San Juan Universities in Argentina. Elaine Keillor is an internationally known concert pianist, and a Distinguished Research Professor Emerita of Carleton University, Ottawa. With all of the theoretical requirements completed at the age of ten, she remains the youngest to have ever received the Associate diploma in piano from the Royal Conservatory of Music (Toronto). Before pursuing musicological studies, she appeared with orchestra and in recital across North America and in Europe. Over the years she continued performing as a collaborative musician and occasionally as a solo artist on the concert stage and for radio and television while lecturing at various universities. As a pianist and chamber musician she can be heard on sixteen CDs that have been praised for their impeccable pianism and artistry. CAML Review wrote about “By a Canadian lady”: Piano Music 1841 – 1997: “Dr. 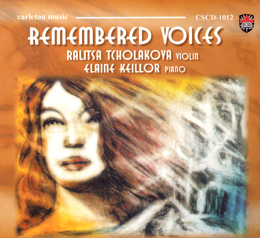 Keillor has admirably designed and performed this compilation, and it stands as a recording of scholarly significance.” Among her recent performances as pianist are concerts at the 2007 Ottawa International Chamber Music Festival, the Ithaca Fortepiano Festival, and a lecture/recital for the Glenn Gould Exhibition, Canadian Museum of Civilization. She was the first recipient in the category of Arts and Culture of the Canadian Women’s Mentor Awards, February 1999. Producing essays for various collections, encyclopedias and dictionaries, she wrote the chapter on music for the widely used third edition of Profiles of Canada (2003), edited four volumes in the 25-volume Canadian Musical Heritage series, two in the piano series Performing Our Canadian Heritage, and authored John Weinzweig and His Music: The Radical Romantic of Canada (Scarecrow Press, 1994), Music in Canada: Capturing Landscape and Diversity (McGill-Queen’s University Press, 2006; paperback edition 2008). Dr. Keillor received the 2004 Helmut Kallmann Award of the Canadian Association of Music Libraries, Archives and Documentation Centres. Hired as a specialist in Canadian music at Carleton University in 1977, she designed and taught the first university course in Canada to explore First Peoples’ musical expressions. Dr. Keillor headed the teams that produced Native Drums (2005) (http://nativedrums.ca), a comprehensive, educational, and information web site on musical expressions of the First Peoples within Canada and its sequel (http://nativedance.ca) on Native Dance (2007), joint projects of Canadian Heritage’s Canadian Content Online Program and Carleton University. Recently her team launched “On the Path of the Elders” (http://pathoftheelders.com). As a violin and piano recording, this one is immediately evident as being at the top of the genre. Performers are first rate, and playing with a passion. Audio production is unusually well done, with none of the bizarre qualities one finds so often nowadays, either of the violinist sounding as if she is larger than the accompanist, or the listener being right inside the piano. Excellent choices were made for the music on this CD, with special emphasis on Bulgarian iconic figure Pantcho Vladiguerov, who is represented by the Chant from his larger Bulgarian Suite, the widely- known Rhapsody Vardar, a Humoreske, plus an encore arrangement of Dinicu’s Hora Staccato. Tcholakova and Keillor show an admirable commitment to Canadian repertoire, beginning with Gena Branscombe’s unjustly neglected A minor Sonata, well represented in this performance. Violet Archer’s Fantasy and Prelude and the Prelude and Allegro are equally well served. But the best is saved for last: we get to hear the violin version of the late Patrick Cardy’s Liessel, Suse, Ilze, and Gerda, and Mary Gardiner’s monumental Remembered Voices, here finally blossoming in a hall vastly superior to the Heliconian Club. The Glenn Gould Studio’s hand-picked Steinway is on its best behaviour. No fewer than three sound engineers did the microphone wizardry. All photos are posed, with none showing the actual recording sessions. "Tcholakova and Keillor are wonderful collaborators who perform with sound musical chemistry. They present a polished, single-minded vision of the music and are able to create all the necessary moments of passion, lyricism, austerity, and dramatic climax. Tcholokova's intonation is excellent, and she possesses a rich and vibrant tone in the gypsy music, and one that is more subtle and intensive in the more serious works. Keillor plays with tremendous clarity and taste and never overpowers the violin. Although the program is a most unusual one, as is the cover art by Dimce Isailovski, it all somehow seems to work. These are voices worthy of remembering."